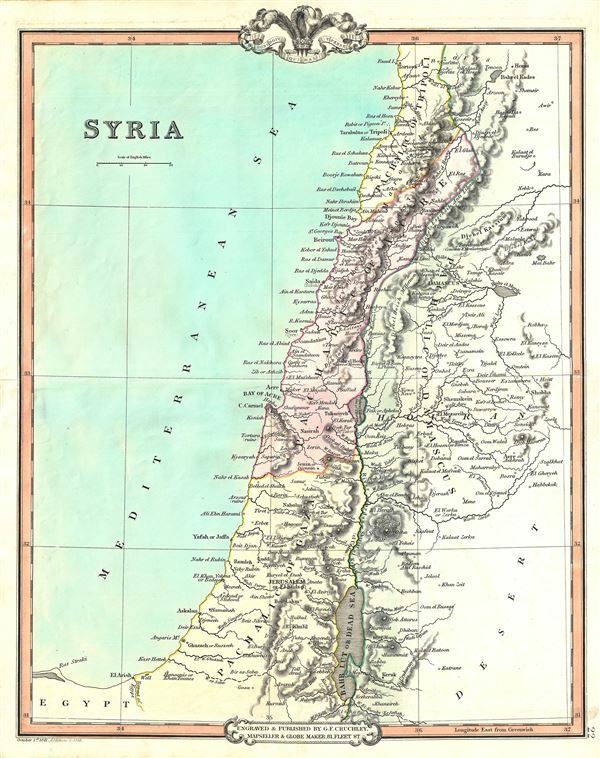 This is an appealing 1853 map of Syria issued by George Frederick Cruchley. It covers from Tripoli to the Dead Sea and includes the modern day countries of Lebanon, Israel, Jordan and Syria. The sites of numerous ancient ruins and monuments are identified as are cities with ancient and contemporary place names. The map is color coded according to regions and territories with relief shown by hachures. Major towns, rivers, mountains, and other topographical features are also noted. This time in history marks the decline of the Ottoman empire. Syria was part of the Ottoman Empire, but largely ignored by world affairs. The map notes the administrative divisions of the Ottoman Empire which include the Pachalic of Gaza, Pachalic of Acre, Pachalic of Tripoli and the Pachalic of Damascus.